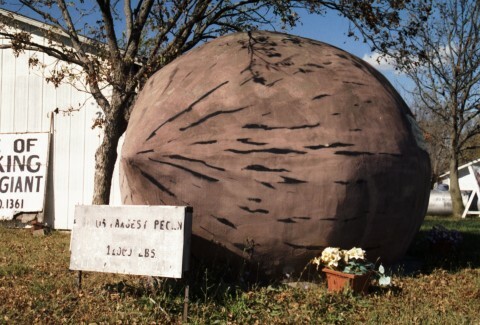 The World’s Largest Pecan is a tribute to a specific patent acquired by the James Pecan Farm in Brunswick, Missouri, the Pecan Capital of Missouri. The closest construction date the lady working the Nut Hut and I could come up with was 1982, but the wife of the builder thought it was a little earlier. The Nut Hut, which serves as both a gift shop as well as a museum devoted to the World’s Largest Pecan, the history of James Pecan Farm, and Pecans in general, adjoins the shelling factory, with the World’s Largest Pecan out by the highway. The widow of Mr. James will tell you stories about pecans and pecan farming, but don’t try to crawl on the pecan, as she gets pretty irate (different trip). Posted here is the little sheet they give out giving the Official Facts , as well as some pecan-related recipes. If you’re in the area, stop by and help support a local industry and World’s Largest Thing. So,not only is it an emblem of a specific geographic region’s industry, it’s an ad for a specific establishment. Brunswick holds an annual Pecan Festival every year, first weekend in October. Nearby, in the same county, you’ll find Maxie, the World’s Largest Goose, over in Sumner. World’s Largest Pecan, on U.S. Hwy. 24, 3 mi. E. of Brunswick, MO, was built by James Pecan Farms Inc. as a replica of their patented Starking Hardy Giant pecan, a large thin-shell variety discovered by George James in 1955. The concrete replica is 7’ dia. x 12’ long, and weighs about 12,000 lbs. The James Farms boast a total of 10,000 pecan trees. 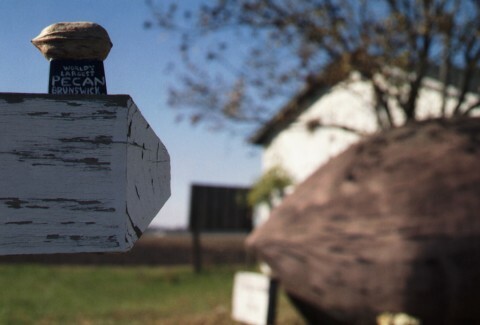 Brunswick is located on the Missouri River in the finest pecan-growing region in the state.